The Beginning of our MURASAKI discussion ! Lady Violett or Lady Purple? Violet is a spectral color (approximately 420 - 380 nm), of a shorter wavelength than blue, while purple is a combination of red and blue or violet light. The purples are colors that are not spectral colors - purples are extra-spectral colors. In fact, purple was not present on Newton's color wheel (which went directly from violet to red), though it is present on modern ones, between red and violet. There is no such thing as the "wavelength of purple light"; it only exists as a combination. The actual color of Tyrian purple, the original color purple from which the name purple is derived, is the color of a dye made from a mollusk that, because of its incredible expense (many times more expensive than gold), in classical antiquity became a symbol of royalty because only the very wealthy could afford it. Therefore, Tyrian purple is also called imperial purple. The pigment MURASAKI is taken from the root of the plant. before the advent of using katakana ? I hope your monitor shows the fine gradations ! Japanese Color Codes Click here for color boxes. Murasaki (紫) is the Japanese word for the colour purple. the wisteria (in Japanese, fuji) thereby referring to Fujitsubo, "the Lady of the Wisteria Court", a woman he is violently in love with for the first part of the novel. It happens that Fujitsubo is Murasaki's aunt. Thus, in a word association game very characteristic of Japanese poetry, the similarity between the two colors led to the name Murasaki, perhaps the most illustrious name in Japanese literature. or Purple Gromwell is a plant species of the genus Lithospermum. It has been cultivated in Japan since the Nara period for its root, which can be used for herbal medicine and to make dyes. One Japanese word for the plant, murasaki (紫), inspired the pen name "Lady Murasaki" for the author of The Tale of Genji and is also the source of the general Japanese term for the color purple, murasaki iro (紫色). The dyes made from its root also had other names, such as shikon (紫 根), but all of them were difficult to work with because of their requirement for an alum-rich mordant and the resulting colors' extreme vulnerability to photobleaching. During the Heian Period, sumptuary laws restricted murasaki-dyed clothing to the Empress and her ladies in waiting. 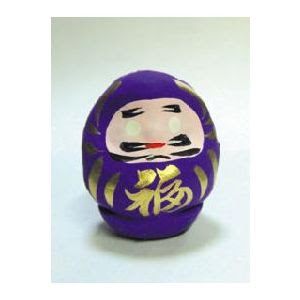 In Jane Reichhold's book of translation of poetry from The Tale of Genji, "A String of Flowers Untied...: Love Poems from The Tale of Genji," she tends to use the same color translation as Seidensticker does: lavender, although she also uses purple as well. 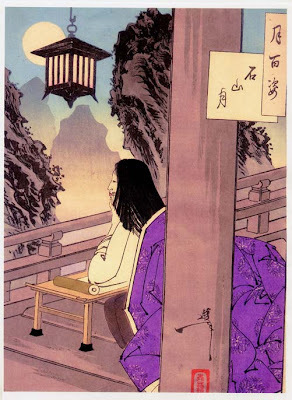 ...Genji begins lessons for Murasaki in poetry and calligraphy. He writes out for her the old poems from the anthologies for her to copy. One day, choosing lavender paper, he wrote the following 'waka' from an unknown author in the 'Kokin Rokujoo'. This is a color of the Feng-Shui system. Its symbolic meaning is : your wish will be fulfilled, of high rank, supremacy and more. Click on the photos for more. when will I set sail? This haiku without season alludes to rebirth in the Pure Land, located somewhere in the mythic west. family Boraginaceae. Herbs or small shrubs.
. Lady Wakamurasaki 若紫 . murasaki 紫草 (むらさき) "Murasaki plant"
It grows wild in many mountain regions of Japan. The root is used for dyeing and medicine. Those　Issa's　haiku are very sensible. I understand that he knew well the color of purple. 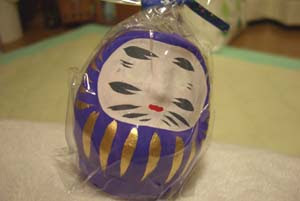 ... the football team was named Kyoto Purple Sanga! "Although the team retains the same basic color scheme, somewhere around the mid-00s local fans began to agitate for a "simpler" name that would roll off the tongue a bit easier. 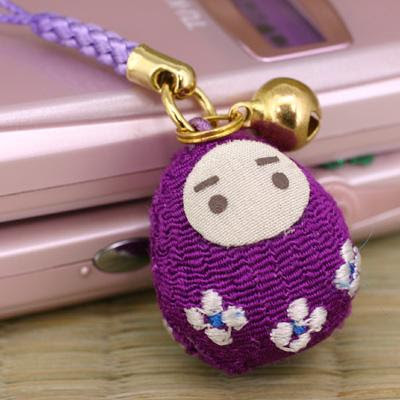 As a result, the "Purple" was officially dropped in 2007 to leave the current name, Kyoto Sanga."